At Pidoco we constantly work on improving your prototyping experience by listening to your feedback. One frequent question has been “Why is it not possible to design web and mobile prototypes in one project?”. Well, your wish is our command, we have merged mobile and web prototypes, and here it is: the all-in-one prototype! As of today there is no functional differentiation between web and mobile prototypes anymore. This means you can create pages for all kinds of devices and screen sizes in just one prototype. The change reflects recent design trends, namely it will allow you to prototype responsive designs much more easily. The new all-in-one prototype makes things a lot easier: Now when going to My Prototypes, there will only be one button to create a new prototype. While you can still pick a default page size when creating a prototype, you don’t need to worry about whether you want your project to be a mobile or a web/desktop project anymore. A click on the button will immediately open the new prototype in the Prototype View. Hovering over the button will let you pick a default page size by selecting your standard device (web/desktop pc, smartphone, 7″ tablet or 10″ tablet). Naturally, you can still adjust each page’s demensions in the prototype, but the default page size will reduce manual work. Another great thing about the new all-in-one prototype is that the elements in the mobile and web/desktop stencil palettes have been combined to give you a much wider range of building blocks for your prototypes. This also includes options like rounded corners in you prototypes. Additionally, the simulation in the Pidoco app, which is available for Android and iOS devices, has been enabled for all your prototypes, even for the previously created web prototypes. 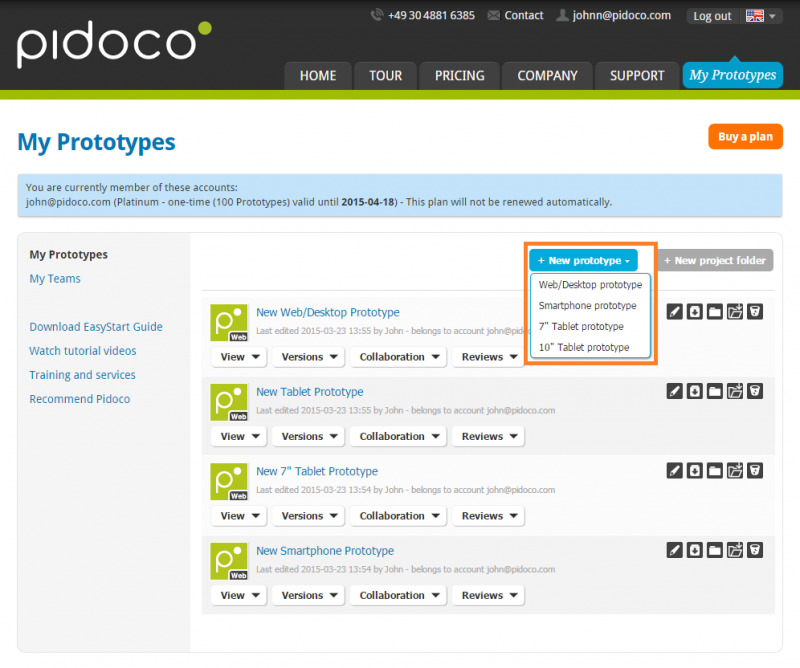 This also means that the mobile sharing option is now available for all prototypes, no matter when they were created. Well, and what about all the good old web and mobile prototypes you have created? Don’t worry, all the prototypes you have created before the arrival of the all-in-one prototype are not affected by these changes. They are still labeled with the tags “Web” or “Mobile” in My Prototypes to make them easy to identify. You will, however, see more stencils in the palette when you open them. How do you like our recent update? Drop us a comment here or via Facebook, Twitter or Google+ or contact us via support@pidoco.com. We are looking forward to hearing from you! By the way, did you know that you can submit your ideas in the Pidoco Forum? Simply make a suggestion and all other users can vote on it. Our developers will comment and keep you updated on the status of your suggestions. PS: You are not a Pidoco user, yet? Why not register for a free 31-day trial today?